"ANA Cargo" redirects here. For the former cargo subsidiary of ANA, see ANA & JP Express. "ANA (airline)" redirects here. For the former Australian airline, see Australian National Airways. For other uses of "ANA", see Ana. All Nippon Airways Co., Ltd. (全日本空輸株式会社, Zen Nippon Kūyu Kabushiki gaisha, TYO: 9202), also known as Zennikkū (全日空) or ANA, is the largest airline in Japan on the basis of fleet size. Its headquarters are located at Shiodome City Center in the Shiodome area of Minato, Tokyo, Japan. It operates services to both domestic and international destinations and had more than 20,000 employees as of March 2016. In May 2010, ANA's total passenger traffic was up year-on-year by 7.8%, and its international services grew by 22% to 2.07 million passengers in the first five months of 2010. ANA's main international hubs are at Narita International Airport outside Tokyo and Kansai International Airport outside Osaka. Its main domestic hubs are at Tokyo International Airport (Haneda), Osaka International Airport (Itami), Chūbu Centrair International Airport (near Nagoya), and New Chitose Airport (near Sapporo). In addition to its mainline operations, ANA controls several subsidiary passenger carriers, including its regional airline, ANA Wings and charter carrier, Air Japan. Additional smaller carriers include Air Do, a low-cost carrier operating scheduled service between Tokyo and cities in Hokkaido; Vanilla Air, a low-cost carrier serving resort and selected international destinations; and Allex Cargo (ANA Cargo), the freighter division operated by Air Japan. ANA is also the largest shareholder in Peach, a low-cost carrier joint venture with Hong Kong company First Eastern Investment Group. In October 1999, the airline became a member of Star Alliance. On 29 March 2013, ANA was named a 5-Star Airline by Skytrax. On 27 April 2018, ANA announced ANA Business Jet Co., Ltd., a joint venture with Sojitz to offer private jet charter flights. ANA's earliest ancestor was Japan Helicopter and Aeroplane Transports Company (日本ヘリコプター輸送, Nippon Herikoputā Yusō) (also known as Nippon Helicopter and Aeroplane), an airline company founded on 27 December 1952. Nippon Helicopter was the source of what would later be ANA's International Air Transport Association (IATA) airline code, NH. Boeing 737-200 in ANA's late-1960s–1983 "Mohican Livery"
NH began helicopter services in February 1953. On 15 December 1953, it operated its first cargo flight between Osaka and Tokyo using a de Havilland Dove, JA5008. This was the first scheduled flight flown by a Japanese pilot in postwar Japan. Passenger service on the same route began on 1 February 1954, and was upgraded to a de Havilland Heron in March. In 1955, Douglas DC-3s began flying for NH as well, by which time the airline's route network extended from northern Kyūshū to Sapporo. In December 1957 Nippon Helicopter changed its name to All Nippon Airways Company. ANA's other ancestor was Far East Airlines (極東航空, Kyokutō Kōkū). Although it was founded on 26 December 1952, one day before Nippon Helicopter, it did not begin operations until 20 January 1954, when it began night cargo runs between Osaka and Tokyo, also using a de Havilland Dove. It adopted the DC-3 in early 1957, by which point its route network extended through southern Japan from Tokyo to Kagoshima. Far East Airlines merged with the newly named All Nippon Airways in March 1958. The combined companies had a total market capitalization of 600 million yen, and the result of the merger was Japan's largest private airline. The merged airline received a new Japanese name (全日本空輸 Zen Nippon Kūyu; Japan Air Transport). The company logo of the larger NH was selected as the logo of the new combined airline, and the new carrier operated a route network combined from its two predecessors. ANA grew through the 1960s, adding the Vickers Viscount to the fleet in 1960 and the Fokker F27 in 1961. October 1961 marked ANA's debut on the Tokyo Stock Exchange as well as the Osaka Securities Exchange. 1963 saw another merger, with Fujita Airlines, raising the company's capital to 4.65 billion yen. In 1965 ANA introduced jets with Boeing 727s on the Tokyo-Sapporo route. It also introduced Japan's first homegrown turboprop airliner, the NAMC YS-11 in 1965, replacing Convair 440s on local routes. In 1969, ANA introduced Boeing 737 services. As ANA grew it started to contract travel companies across Japan to handle ground services in each region. Many of these companies received shares in ANA as part of their deals. Some of these relationships continue today in different forms: for instance, Nagoya Railroad, which handled ANA's operations in the Chūbu region along with other partnerships, maintains a permanent seat on ANA's board of directors. By 1974, ANA had Japan's largest domestic airline network. While ANA's domestic operations grew, the Ministry of Transportation had granted government-owned Japan Airlines (JAL) a monopoly on international scheduled flights that lasted until 1986. ANA was allowed to operate international charter flights: its first was a 727 charter from Tokyo to Hong Kong on 21 February 1971. ANA bought its first widebody aircraft, six Lockheed L-1011s, in November 1971, following a lengthy sales effort by Lockheed which had involved negotiations between US president Richard Nixon, Japanese prime minister Kakuei Tanaka and UK prime minister Edward Heath (lobbying in favor of engine maker Rolls-Royce). Tanaka also pressed Japanese regulators to permit ANA to operate on Asia routes as part of the package. The aircraft entered service on the Tokyo-Okinawa route in 1974. The carrier had ordered McDonnell Douglas DC-10s but cancelled the order at the last minute and switched to Lockheed. It was later revealed that Lockheed had indirectly bribed Prime Minister Kakuei Tanaka to force this switch: the scandal led to the arrest of Tanaka and several managers from ANA and Lockheed sales agent Marubeni for corruption. Boeing 747-200s were introduced on the Tokyo-Sapporo and Tokyo-Fukuoka routes in 1976 and Boeing 767s in 1983 on Shikoku routes. The carrier's first 747s were the short-range SR variant, designed for Japanese domestic routes. ANA Boeing 737-500 at Sapporo International Airport (Chitose). An ANA Boeing 777-200 can be seen on final approach in the background. 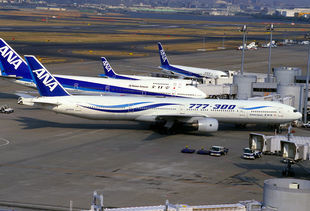 In 1986, ANA began to expand beyond Japan's key domestic carrier to become a competitive international carrier as well. On 3 March 1986, ANA started scheduled international flights with a passenger service from Tokyo to Guam. Flights to Los Angeles and Washington, D.C. followed by year's end, and ANA also entered a service agreement with American Airlines to feed the US carrier's new flights to Narita. ANA expanded its international services gradually: to Beijing, Dalian, Hong Kong and Sydney in 1987; to Seoul in 1988; to London and Saipan in 1989; to Paris in 1990 and to New York in 1991. Airbus equipment such as the A320 and A321 was added to the fleet in the early 1990s, as was the Boeing 747-400 jet. ANA joined the Star Alliance in October 1999. 2004 saw ANA's profits exceed JAL's for the first time. 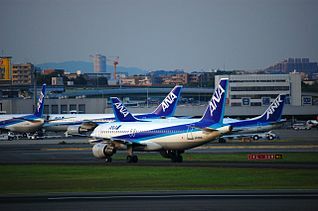 That year, facing a surplus of slots due to the construction of new airports and the ongoing expansion of Tokyo International Airport, ANA announced a fleet renewal plan that would replace some of its large aircraft with a greater number of smaller aircraft. Also in 2004, ANA set up low-cost subsidiary Air Next to operate flights from Fukuoka Airport starting in 2005, and became the majority shareholder in Nakanihon Airline Service (NAL) headquartered in Nagoya Airport. In 2005, ANA renamed NAL to Air Central, and relocated its headquarters to Chūbu Centrair International Airport. On 12 July 2005, ANA reached a deal with NYK to sell its 27.6% share in Nippon Cargo Airlines, a joint venture formed between the two companies in 1987. The sale allowed ANA to focus on developing its own cargo division. In 2006, ANA, Japan Post, Nippon Express, and Mitsui O.S.K. Lines founded ANA & JP Express (AJV), which would operate freighters. ANA is the top shareholder of AJV. It absorbed Air Japan's freighter operations. Air Transport World named ANA its 2007 "Airline of the Year." In 2006, the airline was recognized by FlightOnTime.info as the most punctual scheduled airline between London and Tokyo for the last four consecutive years, based on official British statistics. Japan Airlines took over the title in 2007. In 2009, ANA announced plans to test an idea as part of the airline's "e-flight" campaign, encouraging passengers on select flights to visit the airport restroom before they board. On 10 November of the same year, ANA also announced "Inspiration of Japan", ANA's newest international flight concept, with redesigned cabins initially launched on its 777-300ER aircraft. In July 2011, All Nippon Airways and AirAsia agreed to form a low-cost carrier, called AirAsia Japan, based at Tokyo's Narita International Airport. ANA held 51 percent shares and AirAsia held 33 percent voting shares and 16 percent non-voting shares through its wholly owned subsidiary, AA International. The carrier lasted until October 2013, when AirAsia withdrew from the joint venture; the carrier was subsequently rebranded as Vanilla Air. In March 2018, All Nippon Airways announced the integration of its two low cost carrier subsidiaries Peach Aviation and Vanilla Air into one entity retaining the Peach name; starting in the second half of FY2018 and to be completed by the end of FY2019. On 29 January 2019, ANA Holdings purchased a 9.5% stake in PAL Holdings, Philippine Airlines' parent company, for US$95 million. All Nippon Airways is headquartered at the Shiodome City Center in the Shiodome area in Minato, Tokyo, Japan. In the late 1960s ANA had its headquarters in the Hikokan Building in Shinbashi, Minato. From the 1970s through the late 1990s All Nippon Airways was headquartered in the Kasumigaseki Building in Chiyoda, Tokyo. 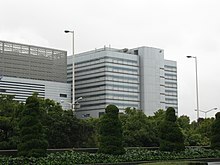 Before moving into its current headquarters, ANA had its headquarters on the grounds of Tokyo International Airport in Ōta, Tokyo. In 2002 ANA announced that it was taking up to 10 floors in the then under-construction Shiodome City Center. ANA announced that it was also moving some subsidiaries to the Shiodome City Center. Shiodome City Center, which became ANA's headquarters, opened in 2003. As of November 2016 ANA operates twelve Boeing 767-300 freighter aircraft. ANA's freighters operate on 18 international routes and 6 domestic routes. ANA operates an overnight cargo hub at Naha Airport in Okinawa, which receives inbound freighter flights from key destinations in Japan, China and Southeast Asia between 1 and 4 a.m., followed by return flights between 4 and 6 a.m., allowing overnight service between these regional hubs as well as onward connections to other ANA and partner carrier flights. The 767 freighters also operate daytime flights from Narita and Kansai to various destinations in East and Southeast Asia. ANA also operates a 767 freighter on an overnight Kansai-Haneda-Saga-Kansai route on weeknights, which is used by overnight delivery services to send parcels to and from destinations in Kyushu. ANA established a 767 freighter operation in 2006 through a JV with Japan Post, Nippon Express and Mitsui, called ANA & JP Express. ANA announced a second freighter joint venture called Allex in 2008, with Kintetsu World Express, Nippon Express, MOL Logistics and Yusen Air & Sea as JV partners. Allex merged with ANA subsidiary Overseas Courier Services (OCS), an overseas periodical distribution company, in 2009, and ANA & JP Express was folded into ANA in 2010. ANA Cargo and the United States-based United Parcel Service have a cargo alliance and a code-share agreement, similar to an airline alliance, to transport member cargo on UPS Airlines aircraft. ANA also has a long historical relationship with Nippon Cargo Airlines, a Narita-based operator of Boeing 747 freighters. ANA co-founded NCA with shipping company Nippon Yusen in 1978, and at one time held 27.5% of NCA's stock. ANA sold its stake to NYK in 2005, but retained a technical partnership with NCA. ANA announced in July 2013 that it would charter NCA's 747 freighter aircraft for an overnight cargo run between Narita and Okinawa, doubling capacity between ANA's key cargo hubs and freeing up 767 aircraft to operate new routes from Okinawa to Nagoya and Qingdao. ANA has an extensive domestic route network that covers the entirety of Japan, from Hokkaido in the north to Okinawa in the south. ANA's international route network extends through China, Korea, Southeast Asia, United States, Mexico, and Western Europe. Its key international hub is Narita International Airport, where it shares the South Wing of Terminal 1 with its Star Alliance partners. ANA's international network currently focuses on business destinations; its only remaining "resort" routes are its routes from Haneda and Narita to Honolulu; past resort routes such as Narita-Guam, Kansai-Honolulu and Nagoya-Honolulu have been cancelled, although ANA plans to expand resort service in the future through its low-cost subsidiary Vanilla Air. As of March 2019, the ANA passenger fleet (excluding subsidiaries) consists of the following aircraft: ANA's Boeing customer code is 81 for all Boeing aircraft except the Boeing 787. For example, a Boeing 777-200ER ordered new by ANA will bear the model number 777-281ER. Airbus A320neo 9 — — 8 — 138 146 Replacing Boeing 737-700 on international routes. Airbus A380-800 1 2 8 56 73 383 520 Entry into service in 2019. Boeing 737-700 7 — — 8 — 112 120 To be replaced by the A320neo with a possible reconfiguration. Boeing 737-800 40 — — 8 — 158 166 One painted in Star Alliance livery. Boeing 737 MAX 8 — 20 TBA Order with 10 purchase options. Deliveries start in April 2021. Boeing 767-300ER 25 — — 10 — 260 270 One painted in Star Alliance livery. One painted in Star Wars R2-D2 & BB-8 livery. — 35 — 179 214 Will be reconfigured and used for domestic routes. Boeing 777-200 9 — — 21 — 384 405 Two painted in Star Alliance livery. Boeing 777-300ER 22 6 8 52 24 166 250 Deliveries until 2019. One painted in Star Alliance livery. One painted in Star Wars BB-8 livery. Boeing 777-9 — 20 TBA Deliveries start in 2020. Boeing 787-8 36 — — 12 — 323 335 Launch customer. Boeing 787-9 30 14 — 18 — 377 395 Deliveries until 2020. One painted in Star Wars R2-D2 livery. Boeing 787-10 1 2 — 38 21 235 294 Order with 7 options. Mitsubishi MRJ-90 — 15 TBA Order with 10 purchase options. Boeing 777F — 2 Cargo Deliveries start in 2019. In addition to its passenger aircraft, ANA operates twelve Boeing 767-300F cargo aircraft. The NAMC YS-11 was an important aircraft for All Nippon Airways, although most of them were used under the name of ANK, or Air Nippon, a subsidiary of All Nippon Airways. The final YS-11 in operation was retired in 2006. A number of YS-11s are in museums, or otherwise scrapped or taken apart. After a final retirement process through September 2006, all YS-11s were grounded, obligated to retire, unless privately owned and were privately restored. The YS-11 was a big part of All Nippon Airways from the 1970s to the early 1990s, when it was used on domestic operations. ANA flew its last flight of an Airbus A321-100 on 29 February 2008. This marked the end of almost ten years of operation of the Airbus A321-100, of which ANA was the only Japanese operator. ANA was the launch customer for the new Boeing widebody, the Boeing 787 Dreamliner, ordering 50 examples with an option for 50 more during April 2004. ANA split the order between 30 of the short-range 787-3 and 20 of the long haul 787-8. However, ANA later converted its -3 orders to the -8 variant. Deliveries finally began in late 2011 when ANA received its first Boeing 787 on 21 September, the first-ever Dreamliner to be delivered in the world. ANA flew its first Boeing 787 passenger flight on 26 October 2011, which operated as a charter flight from Tokyo Narita to Hong Kong. ANA also became the second airline to receive the Boeing 787-9–on 28 July 2014. Despite being second, the airline preceded launch customer Air New Zealand for the first commercial flight on the 787-9, a special sightseeing charter for Japanese and American school children on 4 August. Boeing 727-100 1964 1974 Boeing 727-200 One aircraft crashed as All Nippon Airways Flight 60. Boeing 727-200 1969 1990 Boeing 737-200 One crashed as All Nippon Airways Flight 58. Boeing 747SR-100 1974 2006 Boeing 747-400D One aircraft was hijacked as All Nippon Airways Flight 857. Boeing 777-300 One aircraft was hijacked as All Nippon Airways Flight 61. NAMC YS-11 1965 1991 Unknown One aircraft crashed as All Nippon Airways Flight 533. On 31 July 2014, ANA firmed up orders for 7 Airbus A320neos, 23 Airbus A321neos, 20 Boeing 777-9Xs, 14 Boeing 787-9s and 6 Boeing 777-300ERs, to be used for its short and long-haul fleet renewal. Boeing valued ANA's order at approximately $13 billion at list prices. On 2 February 2015, ANA placed orders with Airbus and Boeing worth $2.2bn for three Boeing 787-10s, five Boeing 737-800s and seven Airbus A321s. In late July 2015, ANA entered into a secret agreement with Airbus to make additional orders in the future (number and model(s) of aircraft unidentified) in exchange for Airbus support of ANA plans to invest in bankrupt Skymark Airlines. Also in 2015, ANA placed orders for 15 Mitsubishi Regional Jets for regional flights, to be operated by ANA Wings. On 29 January 2016, ANA signed a purchase agreement with Airbus, covering firm orders for three Airbus A380s, for delivery from fiscal 2018 to operate on the Tokyo to Honolulu route. The ANA former livery consists of a green and white colour scheme painted as strip sections on the fuselage, with a green vertical stabilizer with the former ANA logo. All aircraft wearing this livery are either retired or repainted. The current livery has a white and grey fuselage, with a blue strip painted under the windows. The ANA logo and their slogan "Inspiration of Japan" is painted on top of the windows. The vertical stabilizer is painted blue with the word ANA painted sideways. Four Star Wars-themed jets: one Boeing 787-9 in an R2-D2 livery; one Boeing 777-300ER in a BB-8 livery; one Boeing 767-300ER in a mixed R2-D2 and BB-8 livery; and one Boeing 777-200ER in a C-3PO livery. In 2019, the three Airbus A380-800 aircraft will be delivered painted in one of three different ANA Flying Honu liveries. The first one of them was delivered on March 20, 2019, at the Airbus Delivery Center in Toulouse, followed by a direct non-stop flight from Toulouse-Blagnac Airport (IATA:TLS) to Narita International Airport (IATA:NRT) in Tokyo. Introduced in 2009, the "Inspiration of Japan" cabin features included fully-lie-flat-bed business class seats, nearly enclosed first class suite seats, fixed shell back seats in both of its economy classes, a new AVOD in-flight entertainment system (based on Panasonic Avionics Corporation's eX2 IFE system with iPod connectivity, in-seat shopping and meal ordering as well as cabin touchscreen consoles) as well as improvements to its in-flight service. ANA will also introduce a new lounge (which opened on 20 February 2010, supposed to be in coincidence with the introduction of new aircraft interiors but delayed [see below]) and check-in concept (later in autumn 2010) at Narita for first class and ANA Mileage Club's Diamond Service elite members. The introduction of the concept also discontinued the use of the name "Club ANA", which was used for its international business class seats (changing into a generic business class name) as well as the name of the lounges (all lounges for both first class and business class are named "ANA Lounge", with the first class lounge called the "ANA Suite Lounge" and its arrival lounge the "ANA Arrival Lounge"). The "Inspiration of Japan" concept has been refitted on its existing 777-300ERs for service on all the airline's North American routes, and may be refitted on its European routes. Parts of it may eventually be phased into its existing Boeing 767-300ERs in service as well as the upcoming Boeing 787s in order. Since February 2010 ANA offers women's-only lavatories on international flights. The first Boeing 787 the airline received have the bidets in both economy and business class lavatory. ANA's inflight magazine is named Wingspan and is available both on board and as a freely downloadable application for Apple's iPad. The iPad version is named 'Virtual Airport' and includes content from Wingspan as well as links to airline booking and online check-in pages. Previously ANA had a dedicated shuttle bus from Düsseldorf to Frankfurt Airport so passengers may board ANA flights at that airport, but the bus service was discontinued after ANA began its Düsseldorf flights; the dedicated Düsseldorf flights began in 2014. ANA sponsored the film Happy Flight, which is about a copilot and flight attendant on an ANA flight to Hawaii. ANA featured in Miss Pilot a Japanese drama about a female pilot. ANA sponsored the Japanese television drama Good Luck! !, about a group of airline crew members. The series starred Takuya Kimura, Shinichi Tsutsumi and Kou Shibasaki. The title for All Nippon Air Line, a BL manga by Kei Azumaya, was inspired by All Nippon Airways. A few of ANA's aircraft were Pokémon themed. However, as of 2014, all of the Pokémon airplanes have been retired/repainted. On 12 August 1958, Flight 025, a Douglas DC-3 (JA5045), crashed 17 km (11 mi) off Toshima, one hour after takeoff from Tokyo en route to Nagoya, killing all 33 on board. In 1958, dynamite was planted in a Douglas DC-3 by Akira Emoto, a candy salesman, as part of a suicide plan. Emoto killed himself by leaping from the aircraft and the bombs failed to detonate. On 16 March 1960, Douglas DC-3 JA5018 was taxiing after landing at Nagoya-Komaki International Airport when North American F-86D Sabre 94-8137 of the Japan Air Self-Defense Force (JASDF) collided with its aft fuselage and tail section while attempting to take off, killing 3 of 33 on board. Although the Sabre crashed and burned, the pilot survived. On 12 June 1961, Vickers Viscount G-APKJ was written off when the starboard undercarriage collapsed following a heavy landing at Osaka Itami Airport. On 19 November 1962, Vickers Viscount JA8202 crashed at Nagoya while on a training flight due to possible pilot error, killing all four crew on board. On 30 April 1963, Douglas DC-3 JA5039 crashed at Hachijojima Airport due to locked up brakes; both pilots survived, but the aircraft was written off. On 10 May 1963, DC-3 JA5040 crashed at Sendai. On 5 June 1963, DC-3 JA5027 swerved off the runway on takeoff at Osaka-Itami Airport and struck the rear of a second DC-3 (JA5078); JA5078 was written off while JA5027 was repaired with parts from DC-3 JA5039. On 4 February 1965, DC-3 struck Mount Nakanoone at 2,200 m (7,200 ft), killing both pilots; the wreckage was located on 29 December 1966. On 4 February 1966, Flight 60, operated by Boeing 727 JA8302, was on approach to Tokyo Haneda Airport when it crashed into Tokyo Bay for reasons unknown, killing all 133 passengers and crew. Following this accident, all passenger aircraft operating in Japan were required to be equipped with cockpit voice recorders and flight data recorders. On 13 November 1966, Flight 533 operated by a NAMC YS-11, crashed in the Seto Inland Sea off Matsuyama following an unexplained loss of altitude while attempting to go-around, killing all 50 on board. On 30 July 1971, Flight 58, operated by a Boeing 727-200 (JA8329), collided with JASDF F-86F Sabre 92-7932 that was on a training flight; the right wing of the F-86 struck the left horizontal stabilizer of the 727 and both aircraft crashed out of control, killing all 162 on board the 727; the F-86 pilot ejected and survived. On 22 June 1995 a man calling himself "Fumio Kujimi" and registered with ANA as "Saburo Kobayashi" hijacked Flight 857, a Boeing 747SR, after it took off from Tokyo. The aircraft landed in Hokkaidō where it was stormed by police, arresting the hijacker. Police stated that the hijacker was 53-year-old Fujio Kutsumi; he had demanded the release of Shoko Asahara. The hijacking incident lasted 16 hours. On 23 July 1999, a man hijacked Flight 61 and killed the captain. He was subdued by other crew members, and no passengers or other crew were killed or injured. On 13 March 2007, Flight 1603 departed Itami Airport to Kochi Airport, where the Bombardier DHC-8-402 landed without its nose landing gear, causing damage to the nose. None of the 60 passengers and crew on board were injured. The failure for the landing gear to extend was determined to be from the landing gear doors not opening due to missing parts. On 6 September 2011, Flight 140, operated by a 737-700 traveling from Naha to Tokyo with 117 passengers and crew, banked over 90 degrees in mid-air and rapidly descended as the first officer accidentally hit the rudder trim switch instead of the door unlock button as the captain returned from the lavatory. The first officer eventually regained control and leveled the aircraft. There were minor injuries to two flight attendants. On 16 January 2013, Flight 692, a Boeing 787 flying from Yamaguchi Ube Airport to Tokyo Haneda Airport reported a battery problem while climbing to FL330. The pilots made an emergency landing at Takamatsu Airport. No casualties were reported during the evacuation. However, after this incident, all 787s were subsequently grounded by respective aviation authorities until the battery issue was resolved. ^ "Airline Membership". IATA. Archived from the original on 11 July 2015. Retrieved 1 October 2012. ^ a b "Corporate Profile". ANA. Retrieved 9 October 2015. ^ "ATW's 2007 Airline of the Year". Air Transport World. Archived from the original on 29 January 2008. Retrieved 19 August 2009. ^ anna.aero. "ANA and JAL both report massive load factor improvement on international services in 2010; ANA grows market share". anna.aero Airline News. Archived from the original on 15 August 2010. Retrieved 4 August 2010. ^ "Online Timetable (Japanese)". All Nippon Airways official website. Retrieved 1 October 2012. ^ "グループ会社一覧". Ana.co.jp. Retrieved 1 October 2012. ^ a b c d e f g h i j k l m n "All Nippon Airways". ANA's history. Retrieved 20 September 2008. ^ "全日空航空公司简介_新浪旅游_新浪网". sina.com.cn. Retrieved 2 November 2009. ^ a b "企業情報 ANA history 1950s". www.ana.co.jp. Retrieved 10 December 2009. ^ "ANA's History". ana.co.jp. ANA Holdings. Retrieved 3 September 2016. ^ a b "All Nippon Airways Co., Ltd. -- Company History". International Directory of Company Histories. 2009. Retrieved 19 August 2009. ^ "boeing | 1996 | 0807 | Flight Archive". Flightglobal.com. Retrieved 1 October 2012. ^ "Corporate Governance" (PDF). All Nippon Airways, Co. Ltd. Retrieved 1 October 2012. ^ a b "企業情報 ANA history 1970's". www.ana.co.jp. Retrieved 10 December 2009. ^ "Somebody Up There Likes Lockheed". Time. 13 November 1972. Retrieved 1 October 2012. ^ "Lockheed President A. Carl Kochian claimed it was extortion, not bribery, that led payments by Lockeed to recipients in Japan". Time. 9 August 1976. Retrieved 1 October 2012. ^ "ANA SKY WEB". www.ana.co.jp. Retrieved 19 August 2009. ^ "企業情報 ANA history 1980's". www.ana.co.jp. Retrieved 10 December 2009. ^ "企業情報 ANA history 1990's". www.ana.co.jp. Retrieved 10 December 2009. ^ "ANA". Star Alliance. Archived from the original on 6 September 2009. Retrieved 1 October 2012. ^ "??". Japan Times. 1 October 2004. Archived from the original on 11 October 2004. Retrieved 2 September 2006. ^ Corporate History (会社沿革, Kaisha Enkaku). "Air-Central" (PDF) (in Japanese). Air-central.co.jp. Archived from the original (PDF) on 26 February 2009. Retrieved 1 October 2012. ^ Air Central, Corporate History (会社沿革, Kaisha Enkaku). Air Central Archived 26 February 2009 at the Wayback Machine (in Japanese) browsed 21 January 2008. ^ "FLIGHTONTIME.info - London to Tokyo Flight Delays & Punctuality". www.flightontime.info. Archived from the original on 5 September 2008. Retrieved 10 December 2009. ^ "Pee Before You Fly". Greenmuze.com. 7 October 2009. Archived from the original on 17 February 2012. Retrieved 1 October 2012. ^ "ANA wants passengers to go before they go | Airline Biz Blog". Aviationblog.dallasnews.com. 7 October 2009. Retrieved 1 October 2012. ^ a b c "ANA press release: "ANA to Launch Innovative Services on International Flights"". All Nippon Airways. Retrieved 10 November 2009. ^ "AirAsia and ANA to form low-cost carrier in Japan". Flightglobal.com. 21 July 2011. Archived from the original on 24 July 2011. Retrieved 1 October 2012. ^ Camus, Miguel R. (29 January 2019). "Japan's ANA, Philippine Airlines seal investment deal". Philippine Daily Inquirer. Retrieved 30 January 2019. ^ a b "Principal Offices." All Nippon Airways. Retrieved on 22 December 2008. ^ "ANA City Offices/Ticketing Offices Japan Archived 13 August 2013 at the Wayback Machine." All Nippon Airways. Retrieved on 22 December 2008. ^ "World Airline Survey." Flight Global. 10 April 1969. 559. ^ World Airline Directory. Flight International. 20 March 1975. "471. ^ "World Airline Directory." Flight International. 30 March 1985. 50." Retrieved on 17 June 2009. ^ "World Airline Directory." Flight International. 5–11 April 1995. 52. ^ "World Airline Directory." Flight International. 31 March – 6 April 1999. "All Nippon Airways" 61. ^ "Corporate Information." All Nippon Airways. 8 April 2000. Retrieved on 19 May 2009. ^ "AboutANA│企業情報│ANA". Retrieved 10 May 2015. ^ a b c "All Nippon Airways Fleet Details and History". Planespotters.net. 23 November 2016. Retrieved 24 November 2016. ^ 佐賀県：有明佐賀空港：夜間貨物便について Archived 19 July 2013 at the Wayback Machine. Pref.saga.lg.jp. Retrieved on 16 August 2013. ^ Francis, Leithen (16 June 2008). "ANA's new express cargo JV Allex to have 14 aircraft". FlightGlobal. Retrieved 17 July 2013. ^ 企業情報. Ana.co.jp. Retrieved on 16 August 2013. ^ Chris Oliver. "All Nippon Airways and UPS to work together amid cargo slump". MarketWatch. Retrieved 10 May 2015. ^ "JCN Newswire - Asia Press Release Distribution". japancorp.net. Archived from the original on 19 December 2010. ^ "全日空、沖縄貨物ハブ拡充　大型機チャーター投入". 日本経済新聞. 17 July 2013. Retrieved 17 July 2013. ^ 中尾, 良平 (29 August 2013). "ＡＮＡ、バニラ・エアで挑むリゾート路線再生". 日本経済新聞. Retrieved 29 August 2013. ^ "Profile on All Nippon Airways". CAPA. Centre for Aviation. Archived from the original on 31 October 2016. Retrieved 31 October 2016. ^ "Partner Airlines - Air India (AI) - Mileage Accural Rates By Fare Type". All Nippon Airways. ^ "ANA and Alitalia in commercial pact". flightglobal. 27 March 2018. Retrieved 27 March 2018. ^ "Business Statistics - ANA". Retrieved 10 May 2015. ^ "ANA Holdings firms up order for A320neo Family". airbus. Retrieved 13 February 2016. ^ "ANA Holdings orders seven additional A321s". airbus.com. 31 January 2015. Retrieved 31 January 2015. ^ ""Hello ANA Group!" The A380 is to join the jetliner fleet of this Japanese carrier" (Press release). Archived from the original on 2 February 2016. Retrieved 1 February 2016. ^ "ANA to introduce A380 for Honolulu routes". 7 March 2017. Archived from the original on 7 November 2017. Retrieved 5 February 2018 – via Japan Times Online. ^ "ANA Plans to Buy A380 Superjumbos to Expand Overseas Routes". Bloomberg. Retrieved 29 January 2016. ^ "The all-new A380: Transforming ANA travel to Hawaii". ANA Official (in Japanese). Retrieved 2 February 2019. ^ "ANA orders 11 more 787-9s". ATWOnline. ^ "ANA Group to place record 1700 billion yen order for 70 new aircraft | Press Release | ANA HOLDINGS INC". www.ana.co.jp. Retrieved 30 July 2018. ^ "MediaRoom - News Releases/Statements" (Press release). Retrieved 10 May 2015. ^ "Boeing Announces ANA's Commitment to Become Newest 787-10 Customer" (Press release). Boeing Commercial. Retrieved 10 May 2015. ^ "Mitsubishi delays MRJ deliveries by two years". FlightGlobal. ^ "Japan's ANA - All Nippon orders two B777 freighters". Ch-Aviation. ^ "Maiden Dreamliner flight lands in Hong Kong". ksdk.com. 26 October 2011. Archived from the original on 3 January 2013. Retrieved 1 October 2012. ^ Flynn, David (31 July 2014). "ANA to beat Air NZ to the world's first commercial Boeing 787-9 Dreamliner flight". Australian Business Traveller. Retrieved 8 October 2015. ^ Muir, Malcolm (7 August 2014). "All Nippon Airways begins revenue flights with the Boeing 787-9". Airline Reporter. Retrieved 8 October 2015. ^ "Fleet History - ANA". ana.co.jp. ^ a b Accident description for JA8302 at the Aviation Safety Network. Retrieved on 10 May 2015. ^ Ranter, Harro. "ASN Aircraft accident Boeing 727-281 JA8329 Shizukuishi". aviation-safety.net. Retrieved 21 March 2019. ^ "PICTURE: ANA retires Boeing 737-700ER". 4 April 2016. Retrieved 5 February 2018. ^ Ranter, Harro. "ASN Aircraft accident Boeing 747SR-81 JA8146 Hakodate Airport (HKD)". aviation-safety.net. Retrieved 21 March 2019. ^ Ranter, Harro. "ASN Aircraft accident Boeing 747-481D JA8966 Tokyo". aviation-safety.net. Retrieved 21 March 2019. ^ "Fleet History: Convair 440 Metropolitan". ANA Holdings Inc. Retrieved 1 September 2016. ^ "Fleet History: DeHavilland DH-104 Dubb [sic]". ANA Holdings Inc. Retrieved 1 September 2016. ^ "Fleet History: DeHavilland DH-114 [sic] Heron". ANA Holdings Inc. Retrieved 1 September 2016. ^ "Fleet History: Douglas DC-3". ANA Holdings Inc. Retrieved 1 September 2016. ^ "Fleet History: Handley Page HP-104 Marathon". ANA Holdings Inc. Retrieved 2 September 2016. ^ a b Accident description for JA8658 at the Aviation Safety Network. Retrieved on 10 May 2015. ^ "ANA firms 30 A320neos, 14 787-9s, six 777-300ERs and 20 777-9Xs". Retrieved 10 May 2015. ^ "Delta outmaneuvered: ANA turned tables at last minute by making Airbus a deal". Nikkei Asian Review. 6 August 2015. Retrieved 10 October 2015. ^ CNN, Tiffany Ap, for. "First Japan-made passenger jet in 50 years". CNN. Retrieved 29 December 2016. ^ "STAR WARS™ JETS". ANA STAR WARS™ PROJECT. Retrieved 21 July 2018. ^ "All Nippon Airways Receives First Airbus A380 (+Photos)". Airways Magazine. 20 March 2019. Retrieved 21 March 2019. ^ "ANA takes delivery of first Airbus A380". Japan Today. Retrieved 21 March 2019. ^ "Bloomberg". Bloomberg.com. Archived from the original on 8 February 2010. Retrieved 10 May 2015. ^ "AFP: Japanese plane seat maker admits falsifying seat data". AFP. 9 February 2010. Retrieved 10 February 2010. ^ "ANA to Launch 'Inspiration of Japan' Cabin Service and Products on Washington, DC=Tokyo Route March 31" (PDF). All Nippon Airways. Retrieved 23 September 2013. ^ "2010年から新しいプロダクト・サービスブランド Inspiration of Japan をスタート" (in Japanese). All Nippon Airways. Archived from the original on 14 November 2009. Retrieved 10 November 2009. ^ "Let ANA inspire you in 2010. Starting with our Narita-New York flights". All Nippon Airways. Archived from the original on 14 November 2009. Retrieved 16 November 2009. ^ "<Apology> Delay in Flight Commencement of the New Boeing 777-300ER Aircraft and Change of Launch Date for New Brand and Service - ANA SKY WEB". Archived from the original on 13 April 2014. Retrieved 10 May 2015. ^ Pawlowski, A. "Airline to introduce women-only lavatories." CNN. 24 February 2010. Retrieved on 25 February 2010. ^ Kesmodel, David (26 September 2011). "On ANA Dreamliner, Bidets and Bigger Windows Await". The Wall Street Journal. ^ "iPad In-Flight Magazines". Retrieved 10 May 2015. ^ "ANA kommt täglich nach Düsseldorf". Flug Revue. 18 December 2013. Retrieved 27 September 2016. ^ Accident description for JA5045 at the Aviation Safety Network. Retrieved on 10 May 2015. ^ "JAPAN: Emoto's Plan". TIME. 12 January 1959. Archived from the original on 1 February 2011. Retrieved 12 February 2010. ^ Accident description for JA5018 at the Aviation Safety Network. Retrieved on 10 May 2015. ^ Accident description for G-APKJ at the Aviation Safety Network. Retrieved on 14 September 2009. ^ Accident description for JA8202 at the Aviation Safety Network. Retrieved on 2 October 2009. ^ Accident description for JA5039 at the Aviation Safety Network. Retrieved on 15 November 2017. ^ Accident description for JA5040 at the Aviation Safety Network. Retrieved on 15 November 2017. ^ Accident description for JA5027 at the Aviation Safety Network. Retrieved on 15 November 2017. ^ Accident description for JA5080 at the Aviation Safety Network. Retrieved on 15 November 2017. ^ "DISASTERS: The Worst Ever". TIME. 9 August 1971. ^ WuDunn, Sheryl (22 June 1995). "Jet Is Stormed And Hijacker Held in Japan". The New York Times. Retrieved 12 October 2010. ^ a b "16-hour hijacking crisis ends/Japanese storm jet, save 364/ Raid ends ordeal; police nab suspect". Houston Chronicle. 22 June 1995. p. A1. Archived from the original on 19 October 2012. Retrieved 23 July 2010. ^ "Man on jetliner demands release of cult's leader". Houston Chronicle. 21 June 1995. p. A15. Archived from the original on 19 October 2012. Retrieved 23 July 2010. ^ "World: Asia-Pacific Japanese hijacker kills pilot". BBC. 23 July 1999. Retrieved 23 July 2010. ^ "AA2008-5 AIRCRAFT ACCIDENT INVESTIGATION REPORT" (PDF). Aircraft and Railway Accidents Investigation Commission. 28 May 2008. Archived from the original (PDF) on 2 April 2016. Retrieved 18 June 2018. ^ "ANA Flight 1603". 801号房. . .内心深处的心声. 14 March 2007. Retrieved 18 June 2018. ^ Ranter, Harro. "ASN Aircraft accident de Havilland Canada DHC-8-402Q Dash 8 JA849A Kochi Airport (KCZ)". aviation-safety.net. Retrieved 18 June 2018. ^ "ANA B737 near Hamamatsu on Sep 6th 2011, violent left roll while opening cockpit door injures 2 cabin crew". The Aviation Herald. 7 September 2011. Wikimedia Commons has media related to All Nippon Airways.